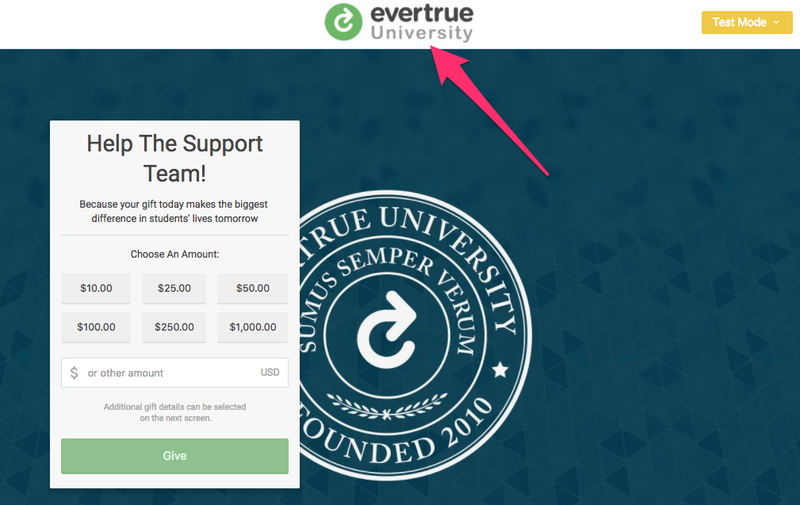 EverTrue recently released several updates to our Online Giving pages. Take a look at all we've been working on - we think you'll like it! Upload a new content image to your giving page! The content image will appear to the left of the payment module and is a great place to convey specifics about why or how your donors should give. Check out this example of a content image, advertising more details about the requested donation. We've updated the mobile experience to better display your image content. Now on mobile, you'll see the background image prominently displayed at the top of your screen. If you are using our new Content Image for any giving page, that image will be displayed instead. Giving Page footers have been given an update to make them more prominent, specifically the "Share with friends!" option, which highlights your page's hashtag. Headline & Subheadline text will now display at the top of the payment module, overlaid on the same white background. This is to allow for the background image to be more vibrant and the text more legible. Now in Test Mode, you can review each page of your donation flow without having to give a test gift. 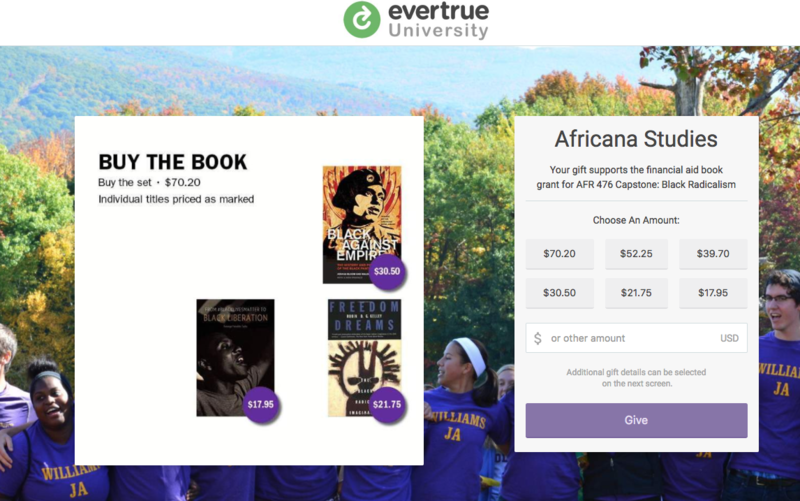 When previewing your giving page, use the "Test Mode" dropdown menu to select the page you'd like to view. 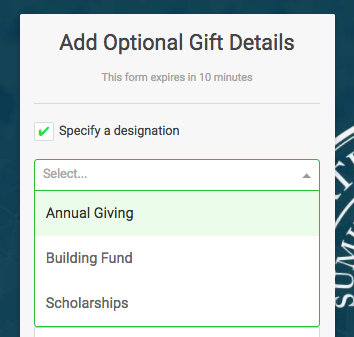 It is now easier than ever for your donors to choose their gift designation with our recent redesign of the designation dropdown menu. We've also added a search bar to the top of this dropdown menu to help your donors quickly select the option they are looking for. Additionally, we'd added the ability for you to input a "Designation Info URL" to provide your donors with more information about the designations available. This URL can be entered under "Gift Designation" during Page Configuration for any giving page. 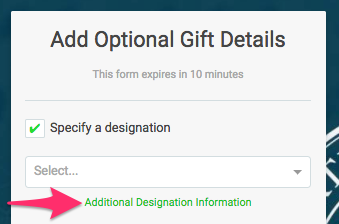 It will then display directly under the designations dropdown menu on the "Add Optional Gift Details" page. 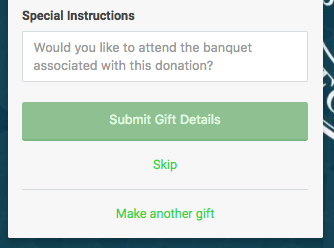 Your donors can now choose to give their gift anonymously by clicking the available checkbox on the "Add Optional Gift Details" page during a donation. 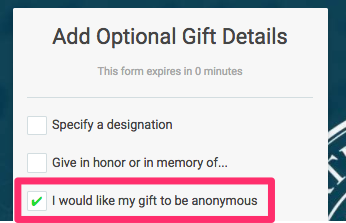 To enable this for a specific giving page, go to the Gift Options section during Page Configuration. 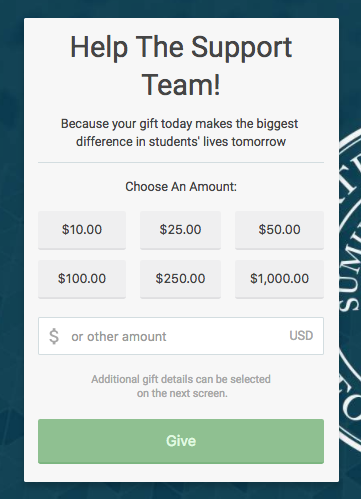 You can now prompt your donor to enter their Class Year on any giving page. 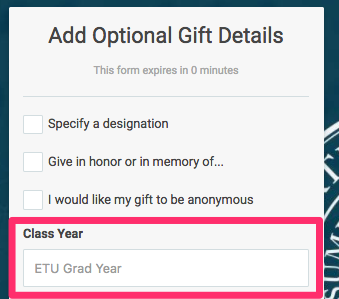 Once enabled, a text box will be available on the "Add Optional Gift Details" page for them to enter their class year. Adding a Header Image to your Giving Page places a distinguishing mark of the institution front and center for the donor. 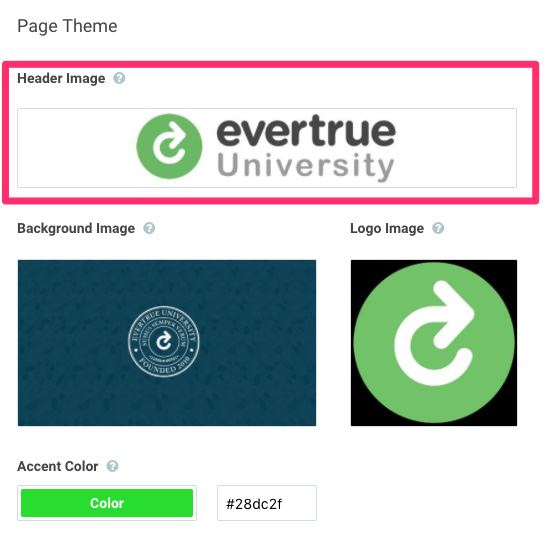 A header image is the best place to display the school's name and logo and can be uploaded under "Page Theme" during Page Configuration. Information on header image dimensions can be found here. 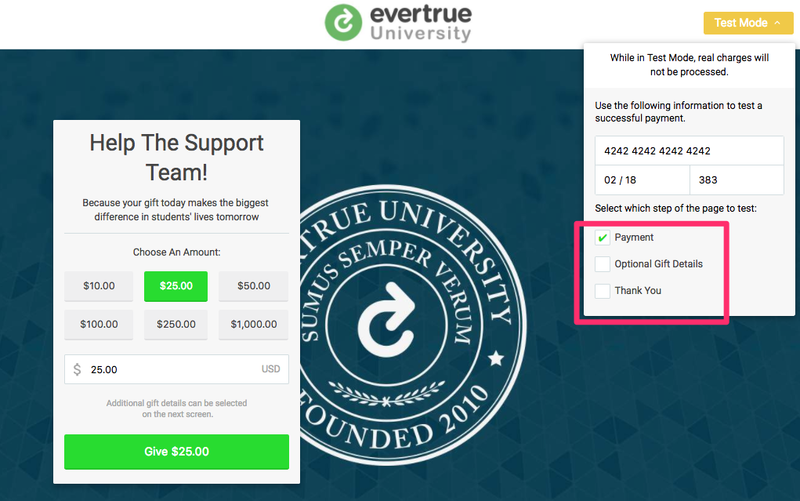 If you were previously using a logo instead of a header image, we will still take that logo for your giving page's favicon and payment module icon, but it will no longer appear on the giving page home-screen.